Oats are great because you can pretty well do whatever you want with them. You can toss in some fruit and nuts to add the flavors you like, combine them with yogurt for a thicker snack, put honey and cinnamon on them for a sweet treat, or eat them plain: the choice is yours! They are a great breakfast to leave you feeling full, or can be the perfect mid-morning snack to charge you up while you’re sitting at work. But aside from the numerous flavor options and easy availability (you can find them at any grocery store, really), oats offer many health benefits. 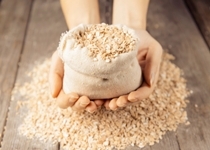 To begin, oatmeal is a great source of soluble and insoluble fiber. Fiber is an extremely important part of a healthy diet, and one cup of cooked oatmeal provides about four grams of it. Soluble fiber stabilizes blood glucose levels and lowers cholesterol, making it vital for healthy blood pressure. Not to mention this also reduces your risk of heart disease, heart attack, stroke, and type 2 diabetes. Insoluble fiber aids in digestion and waste removal from your body, while activating and promoting healthy gut bacteria. It helps keep you regular and feeling great! A cup of cooked oatmeal is enough to fill you up, and contains only 150 calories, each of which is a high-quality calorie. I already mentioned the fiber, but it also provides six grams of protein and 25 grams of high-quality, slow-absorbing complex carbohydrates. I know that “carbohydrates” is generally seen as a bad word, but the truth is that your body needs whole grains. The kinds of carbs offered in oatmeal are extremely healthy and keep you energized and feeling full. Plus, they come packed with the nutrition you need to feel healthy. Additionally, a cup of oats provides more than two grams of quality fat. All of these nutrients are essential to healthy human function. They cause reactions at the cellular level to help your immune system, give you energy, and fuel the complex interactions that ultimately promote better health. And in addition to all of this, oats can even help with weight loss and weight management. Because of the slow absorption rate of complex carbohydrates, oats can help you feel fuller for longer, helping you to resist the urge to eat an unhealthy snack. This helps greatly with portion control and the mid-morning/mid-afternoon crashes that see so many head towards a vending machine. Adding oatmeal to your daily diet is a great way to improve your nutrition and your health. If you decide to add nuts, fruit, nut butters, or another food to your oats, pay attention to how much you’re putting in. It can quickly become very calorically dense, so be conscious of what you add (especially if it’s honey or maple syrup). Lastly, opt for steel-cut oats or whole oats. They take a little more time to cook, but they’ve undergone less refinement and they definitely pack the most nutrition.